(69) Arthur George Knight, Sgt 426402, 10th Bn Alberta Regiment, Canadian Infantry - Genealogists' Forum - We have branches everywhere! 69th of the Old Boys of St Wilfrid's School, Haywards Heath to lose his life in WW1. Arthur was born on 26 June 1886 in Haywards Heath to Edward Henry and Ellen Knight. His father was a carpenter who had also been a St Wilfrid’s schoolboy, the headmaster at the time had often complained about the Edward Knight’s attendance and non-payment of school pence. In 1891 the family lived at the Railway Stables, near to the Burrell pub and railway station. At some time between 1893 when his Arthur’s baby sister Rose died (she was buried in St Wilfrid’s churchyard) and 1901 the family moved to Reigate where they lived at 11 Copse Road. Arthur was 14 at the 1901 census and had a job as an “odd boy” in a builder’s yard. Like his grandfather and father he trained as a carpenter but then left to seek a new life in Canada in 1911 which is where he joined the Canadian Army on 19 December 1914. His papers say he was a carpenter and had served 1 year in the Territorial Army. He was 5ft 9in, had blue eyes, a fair complexion and was declared fit for service. "For most conspicuous bravery, initiative, and devotion to duty when, after an unsuccessful attack, Serjt. Knight led a bombing section forward, under very heavy fire of all descriptions, and engaged the enemy at close quarters. Seeing that his party continued to be held up, he dashed forward alone, bayoneting several of the enemy machine-gunners and trench-mortar crews, and forcing the remainder to retire in confusion. He then brought forward a Lewis gun and directed his fire on the retreating enemy, inflicting many casualties. In the subsequent advance of his platoon in pursuit, Serjt. Knight saw a party of about thirty of the enemy go into a deep tunnel which led off the trench. He again dashed forward alone, and, having killed one officer and two N.C.O.s., captured twenty other ranks. Subsequently he routed, single-handed, another enemy party which was opposing the advance of his platoon. On each occasion he displayed the greatest valour under fire at very close range, and by his example of courage, gallantry and initiative was a wonderful inspiration to all. This very gallant N.C.O. was subsequently fatally wounded. He died in a nearby military field hospital and is buried at the Dominion Cemetery, Hendecourt-les-Cagnicourt, grave I. F. 15. His VC is in the Glenbow Museum in Canada. A commemorative plaque has been erected to honour him in Haywards Heath, at the Town Hall. Arthur's parents were presented with his medal by the king at an investiture at Buckingham Palace. Arthur’s mother died in Reigate in 1923, his father lived on there with Arthur’s sister Nellie and her husband until his death in 1942. Arthur’s cousin George Frederick Watts was another of the school’s Old Boys to die, his mother was Arthur’s aunt Alice Jane Knight. 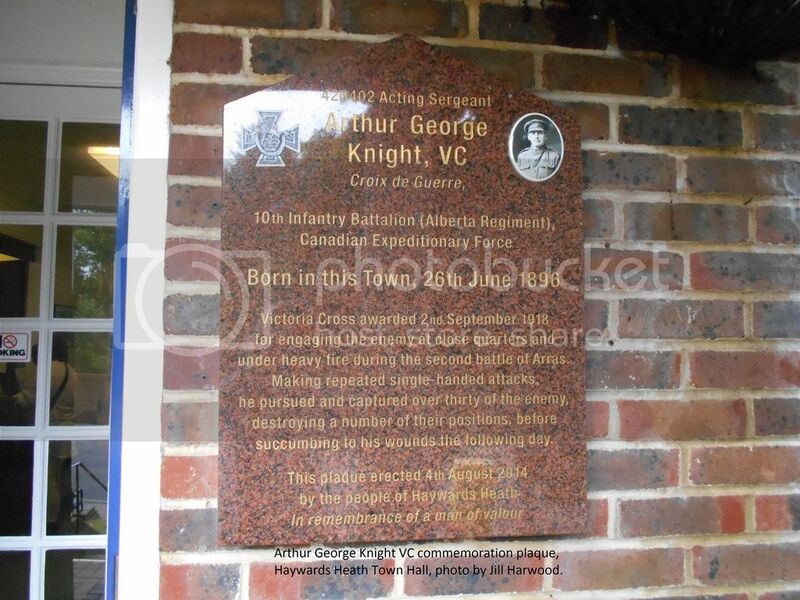 No 426402 a/Sergeant Arthur George Knight, late 10th Battalion Alberta Regiment. For extraordinary gallantry, courage, initiative and devotion to duty in action. At Villiers-le-Cagnicourt on 2nd Sept., 1918, after an unsuccessful attempt had been made to drive the enemy from a portion of the Northern trench of the Buissy switch, this N.C.O. led a bombing section forward under very heavy machine gun, trench mortar, and artillery fire, and engaged the enemy at close quarters. After ten minutes close fighting, seeing that his party continued to be held up, Sergt. Knight dashed forward, alone, bayonetting several of the machine gunners, and trench mortar crews and forcing the remainder to retreat in confusion. He then brought forward a Lewis gun and directed his fire on the retreating enemy, inflicting many casualties, and causing more confusion in their ranks. His platoon then continued to advance close on the heels of the fleeing enemy, and during their move forward Sergt. Knight saw a party of about thirty of the enemy go into a deep tunnel , which led off the trench. He immediately dashed forward again and killed one of their officers and two N.C.O.’s and captured the remainder, amounting to 20 other ranks. When another party of the enemy attempted to hold up the platoon as they were advancing toward their objective, he once more dashed forward alone; and routed their party before they had time to properly organise and oppose the progress of the platoon. On these three occasions this non-commissioned officer performed these extraordinary acts of valour under fire of the heaviest nature, at very close range. He undoubtedly saved his platoon many casualties, greatly aided in the speed of the advance, demoralised each party of the enemy he attacked, and by his example of courage, gallantry and initiative, was a wonderful inspiration to all who saw him. That is a record that fills the hearts of the parents with justifiable pride in their son, who, as we have already recorded in these columns, was later mortally wounded. Sergt. Knight is surely a Redhill boy. Certainly he was born in Sussex, but at an early age he came to reside in Redhill, and at St John’s Schools he was educated. From school to the joiner’s bench, first as an apprentice with Messrs. W. Bagaley and Sons, builders, and then as a workman, he was in our midst. when there was a slump in the building trade some years ago he migrated to Canada, where he “made good,” and was prospering when the war broke out.